Clear, straw yellow pour into a glass from a can, nice head and good, steady carbonation. Wonderful, bright aroma that is equal parts sweet and crisp. This is an excellent indicator of the flavor, which was crisp, sweet, electric and had a nice bite to it that didn't linger overlong. This is a beer made to cool off on hot days, a great beer to relax with. 12oz can. Pours a hazy straw gold topped with clingy white foam head. Pleasant noble hop aroma with a soft breadiness. Crisp and light, but not too light. Lemon rind bitterness upfront that's a bit rough on the palate with a raw leafiness, some grass, herbal and floral flavors. Mostly dry, but there's some malty sweetness and cereal grain folded into a bready malts. Dry, grainy finish. 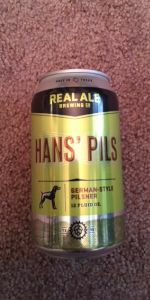 A bit rough around the edges, but this is a good stab at a German-style Pils with a ton of drinkability. Poured from the can into a Libbey style pilsner glass. Deep golden lemon, shiny, with a bit of haze to it a little, but with lots of ample rising carbonation and perfectly near spaced bubbles from the bottom. Head is bright white and fluffy at a solid three fingers. Rises with soapy retention and hang a bit with pill and some clingy lace. The body color even has a bit of green hue to it. Nearly perfect looking real impressive. An extemely clean and very subtle classic nose. Clean malt and crisp sensing with a mild herbality. Good notes of thick bread dough and classic hinting chewy quality. Gets virtually mouthwatering after quite a few snifs. Palate really sings. First sip fills with a bit of classic bread dough but is a bit hammered down by a controlled crisp effervescence and hop flash. Big huge lemon lime hop flavors in the mid palate, with a good rush. Chewy and crisp with a big classic density, and large almost champagne wash and dryness, but thick honey just a bit with some warmth and time to stay true to pils character. Great flavorful and tasting pils, this one is a winner. Poured into a pint glass at Freetail. Appearance: Hazy pale yellow with a fluffy white head about a centimeter thick that fades to a thin lacing and clings to the side of the glass. Aroma: Very fruity and spicy, pineapple and peach notes are what I can pick out. Taste: Complex and fruity, with pineapple and apple flavors and a yeasty earthiness. Mouthfeel: Light body and high carbonation with a dry finish. I could easily see myself drinking more. Overall: This is definitely one of the best Pils I've ever had due to the complexity that is not usually associated with the style. Pours a light golden color. It’s hoppy in a way that most pilseners aren’t, with a wonderful Czech Saaz hop profile on the nose and palate. There’s a crisp, dry finish and a some faint biscuit on the nose that reminds me of the Real Ale Fireman’s. Some chew, a fuller body than I’d expect for a pils but not in a bad way at all. This might be my favorite pilsener at the moment.